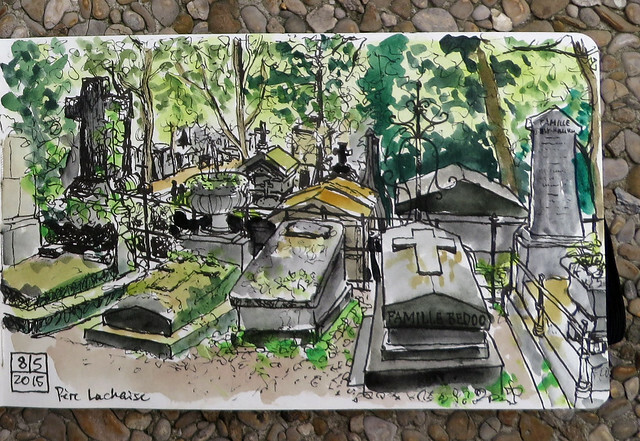 Drawing at Père Lachaise Cemetery with my sketching friend from Berlin. 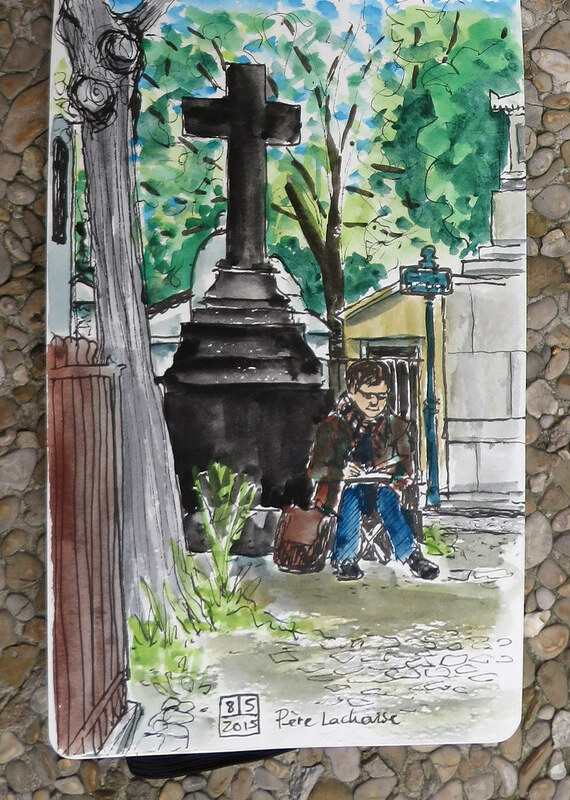 My Berlin friend drawing at Père Lachaise Cemetery. The week of May 4, a lot of work came in for me, as well as my first visitor, and I was keeping my head down. It didn’t help that I got a GI bug early that week which lasted about 10 days. My friend got it too, so it must have been something we ate. It may have been a ripe cheese that he forgot to take out of his backpack after shopping. I had wondered why the living room was smelly. I waited 4 days to see if it would pass on its own, but when I didn’t feel any better on day 5, I called S.O.S. Médecin, an emergency doctor service, and a doctor came in on a Saturday to make a house call. They still do that here in France. It was a bit strange. I had to lie down on my bed, while the doctor took my blood pressure, and patted my stomach. He was inordinately impressed with my blood pressure, by the way, but I have no idea why. I know it’s quite low. I asked him, resigned: “Je ne peux pas manger des croissants?” and he laughed. “Non, seulement riz et bouillon.” So I tried that for a couple of days to give my stomach a break, but snuck in some chocolate anyway. He also prescribed some medicine to slow down my système, and some pain killers for the stomach. I’ve never had anything like this for so long. Welcome to Paris. I had to make do with longingly drawing my second visitor’s pastries but I abstained for about 2 or 3 days after the doctor gave me the stern advice, then I slowly began to feel better. I had planned to drink a half bottle of wine a day in Paris. Now I am far behind on my drinking regimen. Definitely not sick enough to stay home. 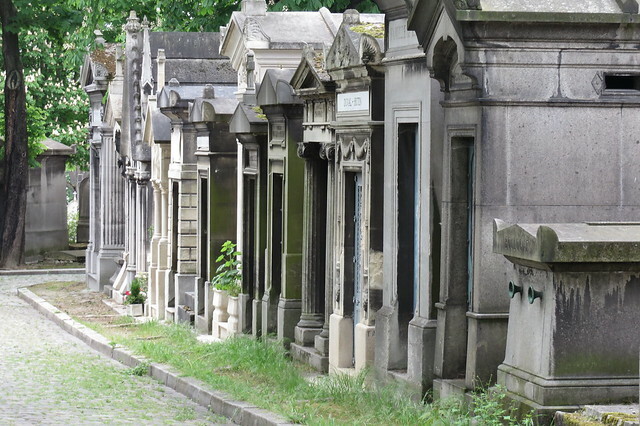 There seemed to be a main street of bigger grave stones, and then the smaller ones in the side streets. 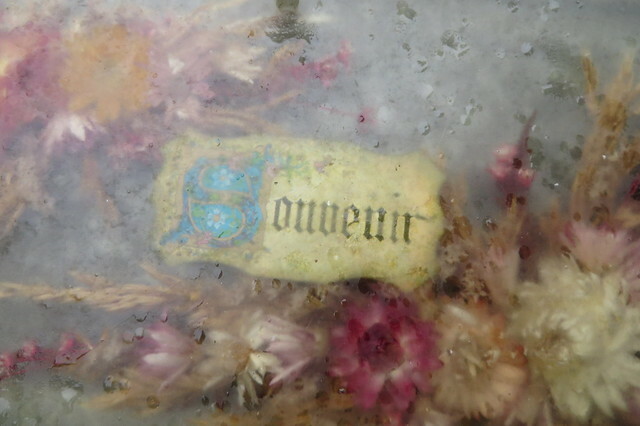 Flowers in resin, detail on a grave. 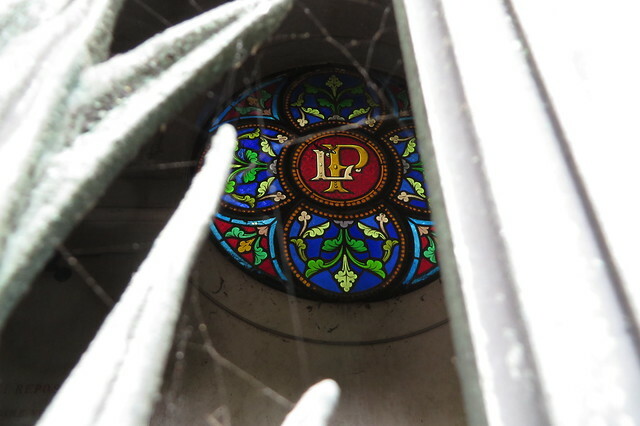 Detail in a grave monument. 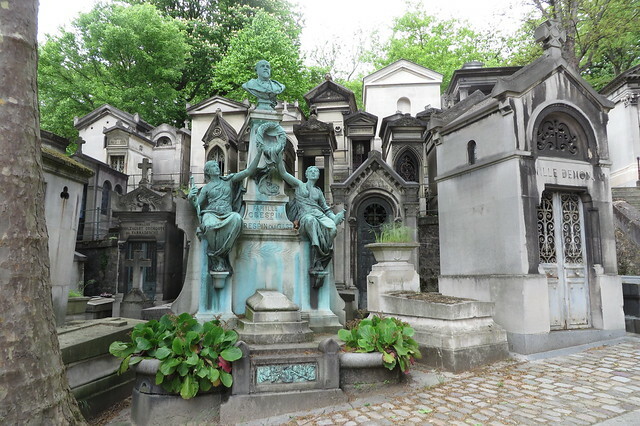 Everything here is pretty much left to rot, I am sure the bigger, fancier monuments get fixed up, but a lot of smaller ones are decaying, which is just as it should be. 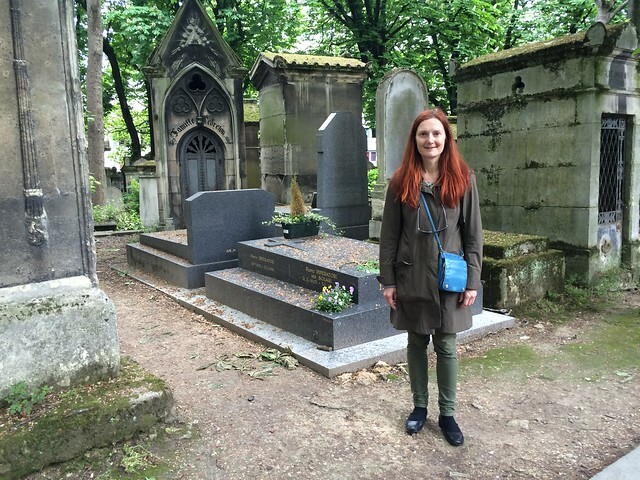 A jungle of grave stones.